I'm excited to share a project that I've been keeping a secret for quite some time. It hasn't been a total secret, since I used to have it as one of my rotating banner images. 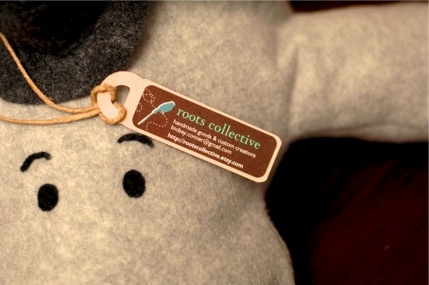 But, since I've never blogged about this little guy, let me introduce you to Hugh Manatee. Over a year ago, I was thinking about a plush toy I could design to submit to the sequel to one of my most beloved sewing books, One Yard Wonders. The call for submissions asked for project ideas designed using a variety of fabrics. I set out to design a project with fleece, and started to think about animal designs that were not currently out there. 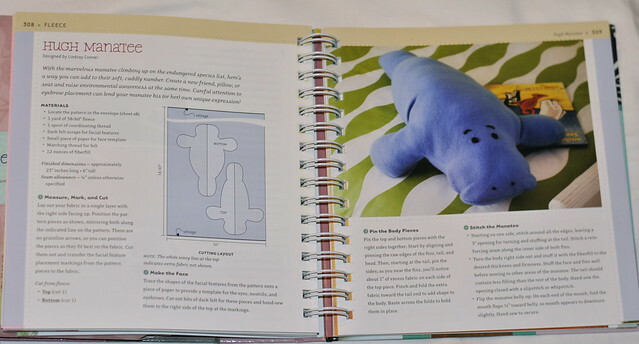 After searching and searching the Internet, I did not find any sort of manatee sewing pattern that was larger than a desk toy. I was searching for a big, cuddly friend, like a snuggle pillow. So I set out to design a manatee sewing pattern, with my trusty roll of teal-striped wrapping paper that I use for most of my pattern designs. 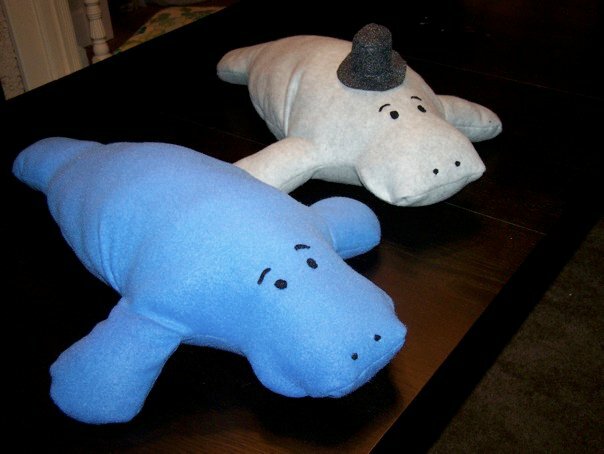 My first manatee was in light gray, and I also made one in blue, which photographs better. The most difficult part of designing this pattern was getting the mouth and face to look wrinkled and adorable. I knew I wanted a comical, cute face rather than a true-to-life frowny manatee. I spent a lot of time arranging felt faces on the manatee, then snapping photos. Then I'd go back later and rearrange the eyes and nostrils until I loved it! Then it was time to ship him off, to be photographed for the book. I've heard he went to the book release party with the other 100 projects. 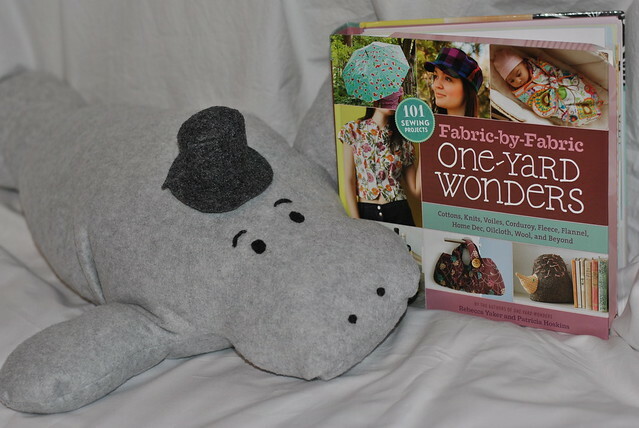 Here he is in the book, Fabric-by-Fabric: One-Yard Wonders. And my original, with top hat! Next week, I'll tell you how you can win a copy of this new book. And if you don't win, please put this immediately on your holiday wish list! It's such a great value, with some really classy patterns for clothing, bags, home decor, toys, accessories, and lots more! You are going to LOVE it. Wow, Lindsay, I had NO clue how famous you are! Congrats, that is thrilling!!! Oh my goodness!! That is SO awesome and cute!! Congratulations on being in a wonderful book! I am going to have to pick that one up for sure!! I love Hugh!! Wow!! Congratulations! The manatee is so cute. And now I can hear the Veggie Tales song in my head. ;) Barbara manatee *manatee manatee*, you are the one for me *one for me one for me*. Are you singing it now? ;) I'm pinning this. :) The book looks like fun. That is so flipping awesome. I love HUGH! Congratulations, Lindsay! That's fantastic :) He's adorable! Lindsay this is such a fantastic project (love the little top hat)! You know I adore softies and cute little sewn creatures, so I will be checking out this project (and book!) for sure. :) Big congratulations to you! This is adorable, and congrats on being published! Congratulations, Lindsay!! This little manatee guy is so darned adorable! Congratulations, Lindsay! That is such a fun project! This is incredible and wonderful and I am so very very proud to have a friend who follows her dream. And that is very corny, and you have every right to laugh, but I couldn't think of any other way to put it when it's so very much what I feel. Congratulations, Lindsay! Hugh is absolutely adorable. How clever of you to think of a manatee. I love the little hat you gave the beige one too. ADORABLE! 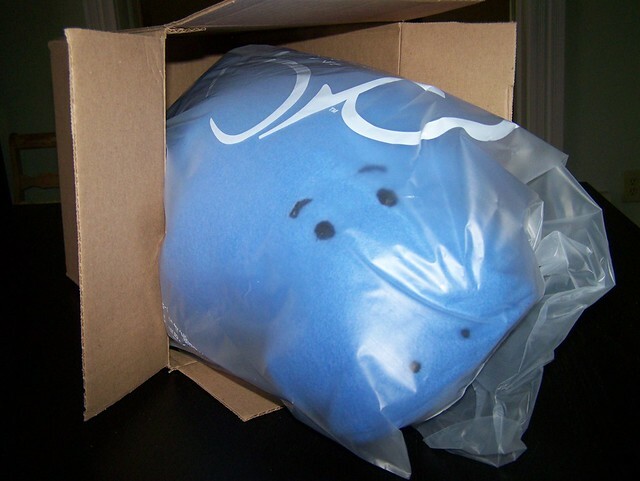 I remember your manatee doll, but I had no idea he had such a punny name ... love it! Congrats on being in the book!! Congrats for being published Lindsay, you totally deserve it, he is too cute! I totally understand about arranging the face on the manatee. I crochet stuffed animals and I am always afraid of putting the eyes/face in the wrong spot and having them look frustrated or angry instead of cute. Also, congratulations with getting published. That is too cool! Hi, I am Jamie from Maryland. Couldn't figure out how to fill out the form! Sorry!! !